Today, we released our Quorum Quarterly Report: Measuring Legislative Trends and Social Media Activity in Q1 of 2018. This report analyzes how the legislative activity in the first fifteen months of the 115th Congress compares to the past ten Congresses. Using Quorum's social media monitoring tools, we also identified the top hashtags used and the most frequently mentioned news outlets by legislators in the first three months of 2018. You can download the full Quorum Quarterly Report here. 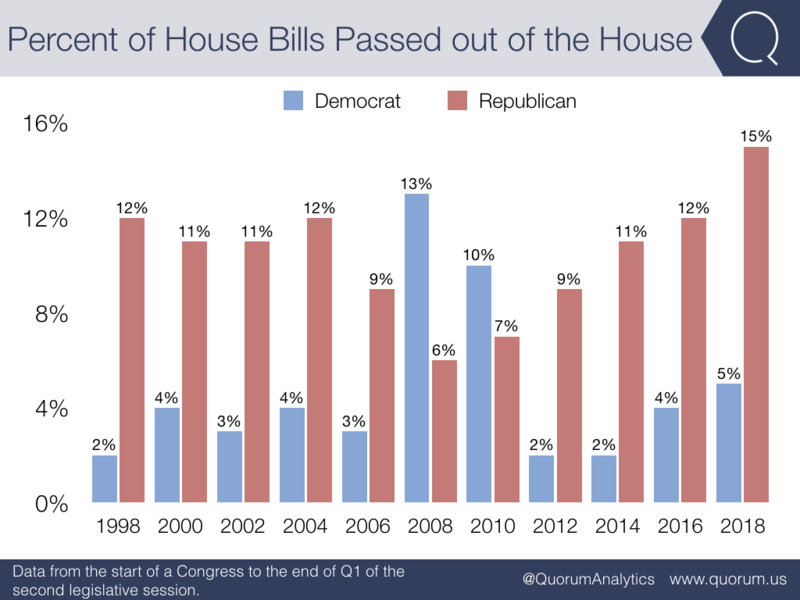 House Democrats are passing a higher percentage of bills out of the House than they have since they held the majority in 2010. Fifteen months into the 115th Congress, House Democrats are passing 5 percent of all bills introduced out of the chamber compared to House Republicans 15 percent. Since the 112th Congress, House Democrats have slowly increased their ability to move their legislation through the chamber. By the end of March, President Trump had signed 160 bills into law. 44 Senate bills and 116 House bills received President Trump's signature between January 2017 and March 2018. 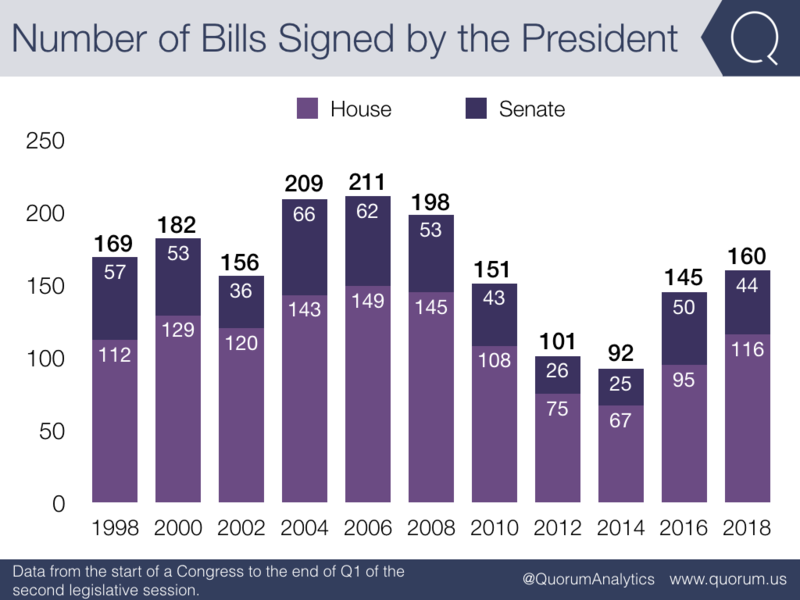 At this point in the congressional term, and with his party in control of Congress, President Trump signed the most legislation since 2008, President George W. Bush's final year in office. Republicans' top hashtag on Twitter was #taxreform. 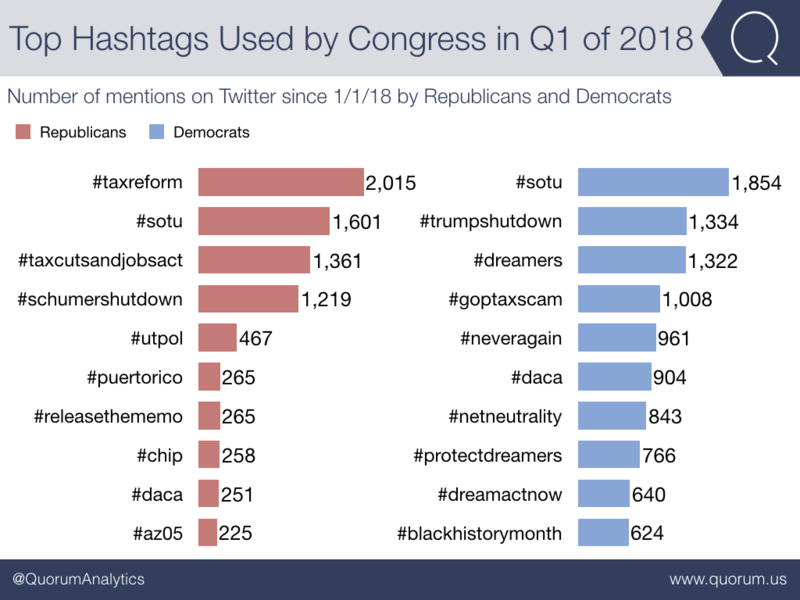 Four of the top ten hashtags used by Democrats referenced DACA or Dreamers. Two of the top three hashtags used by Republicans in the first three months of 2018 were about tax reform—#taxcutsandjobsact and #taxreform. Four of the top ten hashtags used by Democrats related to the debate over DACA including #dreamers, #daca, #protectdreamers, and #dreamactnow. Four of the top five news accounts Republicans mentioned on Twitter were Fox News programs. 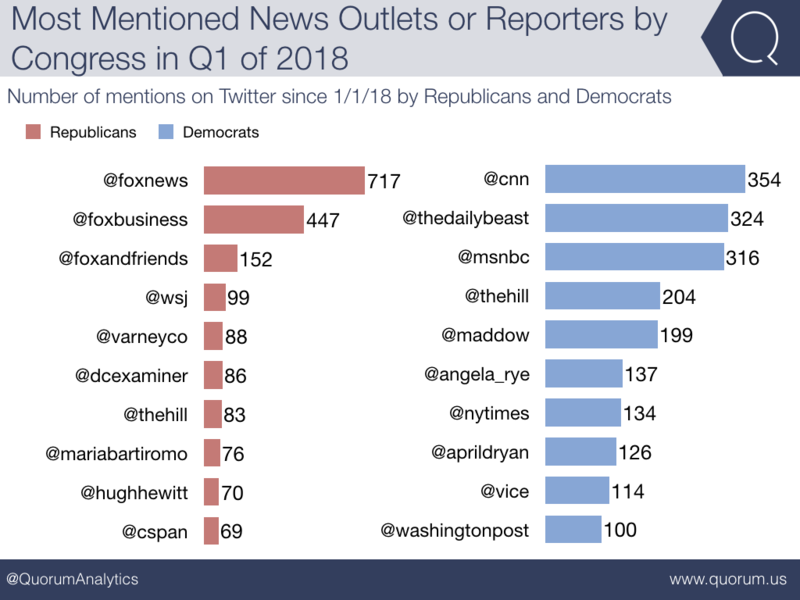 @foxnews, @foxbusiness, @foxandfriends, and @varneyco all made the top five most mentioned news outlets or reporters by Republicans on Twitter since January. @CNN was the most popular among Democrats.